Social impact refers to how the organization’s actions affect the surrounding community (source: Wikipedia, Social Impact). When you have a high enough degree of social impact, you affect the culture of an area. The Christian Culture Center’s goal is to increase the impact of Christ in culture. To do that we have to make a large social impact. How do we make a substantial social impact? By reaching one person at a time, but one right after the other! We have to reach many people, and we have to rely on each person we meet to help us by reaching out to others with our mission and opportunity to get involved. Social impact comes through a series of steps captured in the chart below. Social impact begins with understanding who you are in Christ. This is the foundation for social impact, represented by “Purpose, values, self-awareness and motivation” on the chart above. When you understand who you are in Christ, you have something to share with others. Do you know who you are in Christ? Do you want to make a social impact for Christ? Once you do know who you are in Christ, make yourself available to others. Make yourself visible and participate in activities and events where you can meet other like-minded people, and where you can meet others who need what you have to offer. Social impact requires social engagement. Participate and collaborate with others in your community. Build relationships with others in your sphere of influence. Connect and relate. 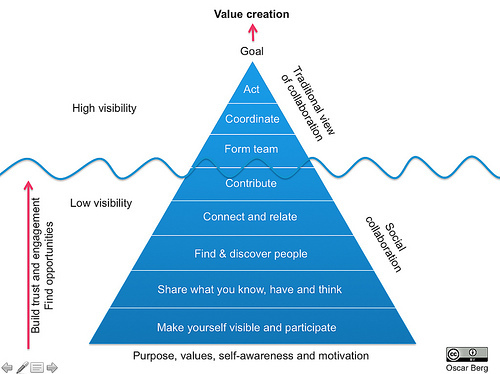 All these are aspects of social collaboration. You’ll soon see doors starting to open and more opportunities to share what you have to offer will become available. This is exactly what we are working on at The Christian Culture Center to foster social impact. We’ve built our Christian Culture Center Blog, our Facebook page (http://facebook/christianculturecenter – LIKE us!) and are building our Likes and Shares. We are working on building relationships with others who want to make an impact for Christ in culture. After 6 weeks, our Facebook page has gained over 6200 Likes and we’re well on the way to our 3-month goal of 10,000 likes. The top three rungs on the latter include building a team (The Advisory Board and our Involvement Partners Program), coordinating our activities and acting on specific projects that we sponsor (The Salvation Story and the Community Funding Initiative). Building the infrastructure to make a social impact requires much time and effort. The more people who participate, the less each of us has to do individually and the more we accomplish as a team. The benefits of social impact include building up the body of Christ (the universal Church of which Christ is the head) and cleaning up our culture for Christ. There’s much work to be done and few workers in the field. Now is the time to get involved for today is the day of salvation. If you’d like to make a social impact for Christ, follow the steps outlined in this article and follow God’s lead in your life. Whether you get involved with the Christian Culture Center or not, we hope you make an impact for Christ with whatever it is that you do. If you do want to work together with us, use the links above to get started. We look forward to hearing from you!